Cold times ahead? Are we entering a repeat of the Dalton minimum? Read also here, here and here. A case against precipitous climate action New excellent article by Prof. Richard Lindzen (MIT): "...for more serious leaders, the need to courageously resist hysteria is clear". An absolute must read! Biofuels drive up food prices From the hauntingthelibrary blog. 10.6 M$/day That's how much do the USA do spend on Climate Change! The x billion European Carbon fraud Read Europol and comment. Shale gas Is it the energy source of the 21th century? The Decline Effect Does the "decline of illusion" also show up in Climate Research? The great HFC-23 scam: Mindblowing! "The CDM has made destruction of HFC-23 so valuable that, at least for some manufacturers, it has become the product, not the by-product"(EurActiv). Also here and here. Snowfalls are now just a thing of the past CRU prediction in 2000: "Snowfalls are now just a thing of the past...Children just aren't going to know what snow is.." Trust them! 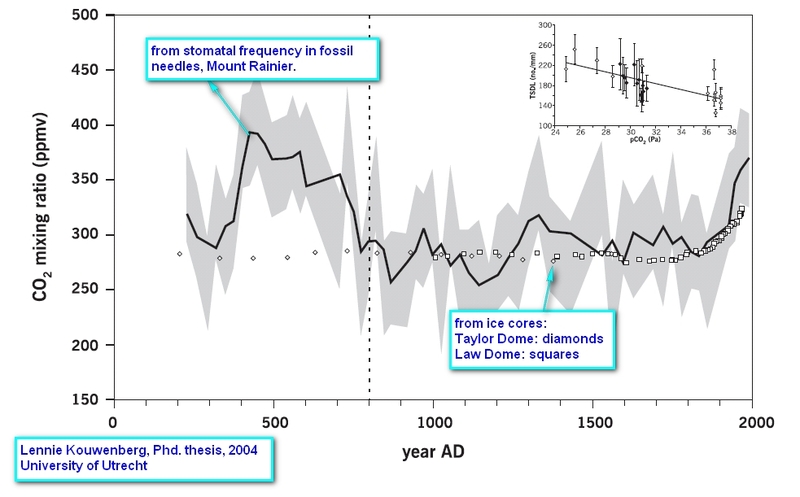 On the recovery from the Little Ice Age By Prof. Akasofu in Science Research. Also this paper on recent energy balance by Knox & Douglass. Do clouds cause a positive or negative feedback? Lindzen and Spencer showed it being negative, Dessler has a new paper using the same data and concludes the feedback is probably slightly positive. Read also Spencer's and Dessler's comments on this most important parameter. Renewables Won't Keep the Lights On Article by John Constable in "Standpoint" magazine: "No one knows whether there is a green low-carbon economy waiting for us in the more distant future, but we can be confident that the current policies — the EU Renewables Directive, the Renewables Obligation, the Feed-In Tariff and the Green Deal — are most unlikely to deliver such an outcome. Indeed, they are probably counterproductive, since they insulate nascent technologies from competition and thus infantilise them." Sea level rise: not so simple! From Spiegel Online. Read slso here! Most recent graph. The Chigaco Climate Exchange (CCX) closes down Is this the end of the CO2 bubble? Also here. and absolutely must read here! Hearing at the U.S. House of Representatives "A Rational Discussion of Climate Change". Testimonies of Richard Lindzen, Patrick Michaels and Judith Curry. Entry page to all hearings is here. Scientific American incovenient poll Results of a poll the Scientific American made among its readers on the state of climate science. Probably SciAm regrets having launched this! Recent Energy Balance of the Earth New paper by Knox & Douglass on the evolution of the ocean heat content anomaly as measured by the Argos floats. Trend is slightly negative from 2003 to 2008. Resignation letter to the APS Physics professor Harold Lewis from University of California ( a student of Robert Oppenheimer) resigns from the American Physical Society after 67 years of membership, because he can not bear anymore the APS's official position on climate change: "...the global warming scam, with the (literally) trillions of dollars driving it, that has corrupted so many scientists, and has carried APS before it like a rogue wave. It is the greatest and most successful pseudoscientific fraud I have seen in my long life as a physicist". Strong words, more in his letter! Le changement climatique Report of the French Académie des Sciences (in French, with comments/highlights by F.Massen). Read also here (Vincent Courtillot's comment), here, here, here and here. Let’s make the ‘human footprint’ even bigger Remarkable speech by Brendan O'Neill, editor of spiked, on environmentalism and human footprint. Climate Change, a summary of the science Report by the Royal Society has released it's updated report ". While still very pro-warming, the tone is much more sober and uncertainties more outspoken. Read the full report, not just the summary. Also this critique here and here. No pressure Climate skeptics, be prepared! Watch the famous video of the exploding kids from the activist 10:10 organization: How to cut carbon emissions (also titled: No Pressure). Attention: this video is not for the faint of heart! Climate Change Assessments Full IAC (InterAcademy Council) report on the IPCC here. Executive Summary here (jump to page 13 of the pdf file). Read Christopher Booker's comment here. Wind falters while Nuclear surges Excellent article by D.L. Hoffman with many links to others (like the IEEE article: After soaring, wind glides). Read also the very complete and damning 3 part article on wind energy by Kent Hawkins: Wind is not power at all. (link to part 3, contains links to part 1 and 2). For the moment, the best comment in this ongoing debate seems to be given in the last lines of the IEEE article: "All this is just a reminder that while wind is going to be a big part of the answer to future green energy needs, it will not be the whole answer" (personally I would omit the qualifier "big"). Read also this WSJ article by R. Bryce: Wind power won't cool down the planet. Climate policy and Corporate Behaviour Very interesting paper by Commins et al. on the influence of climate policy (=energy taxes) on EU corporate behavior: "On the whole, energy taxes increased total factor productivity and returns to capital but decreased employment...While energy taxes create jobs, more jobs are destroyed... for the EU ETS the effect on productivity and profits are negative, while the effect on labour and investment are insignificant". Aviation seems to be the big overall loser. What the Earth knows Extraordinary article of Stanford professor Robert B. Laughlin, physics nobelist 1998. Estimation of climate sensitivity based on top-of-atmosphere radiation imbalance A new paper on climate sensitivity by Lin et al. Read also Prof. Pielke's comment on this paper. Empirical evidence for a celestial origin of the climate oscillations and its implications New important paper of Dr. N. Scafetta: "The partial forecast indicates that climate may stabilize or cool until 2030-2040...The significant warming of the Earth predicted by the IPCC  and by other AGWT advocates to occur in the following decades is unlikely. In fact, the above findings clearly suggests that the IPCC has used climate models that greatly overestimate the climate sensitivity to anthropogenic GHG increases. Therefore, the IPCC’s projections for the 21st century are not credible." Global Warming Advocacy Science: a Cross Examination Very interesting new research paper (80 pages) by J.S.Johnston from UPenn. History Lesson on oil independance Something to chuckle! Climate Gate and the Crisis of Climate Alarmism Editorial by Prof. R. Lindzen, WSJ. Massive solar fraud of 2.6 million Euro Between November 2009 and January 2010 about 4500 MWh of electricity were pumped by "solar sources" into the Spanish grid from midnight to 7 a.m. Also here. The problem of the missing heat Read here, here, here and here. 4th International Conference on Climate Change All major videos. The Hartwell Paper "Climate policy, as it has been understood and practised by many governments of the world under the Kyoto Protocol approach, has failed to produce any discernable real world reductions in emissions of greenhouse gases in fifteen years. The underlying reason for this is that the UNFCCC/Kyoto model was structurally flawed and doomed to fail because it systematically misunderstood the nature of climate change as a policy issue between 1985 and 2009"
The Global Warming Winners There are big profits in climate hysteria. Editorail from the Washington Times, 03Mar2010. Climate Change and its Causes This booklet of Dr. N. Scafetta from Duke University is certainly one of the best resuming most recent knowledge on climate change and its causes. The IPCC AGW hypothesis plays down natural causes and variability and clearly exaggerates human influence. Polynomial Cointegration Tests of the Anthropogenic Theory of Glopbal Warming New paper by Beenstock et al (in Nature): "a doubling of greenhouse gas forcings does not permanently increase global temperature". Also here! The Crumbling Pillars of Climate Change by D. Hoffman. From the blog "The Resilient Earth"
Copenhagen and the demise of green utopia by Dr. Benny Peiser. From GWPF. Global Warming: the other side. A 5 parts TV emission by weatherman J. Colemann on AGW and showing the data manipulation of the NCDC. Cosmic-ray-driven electron-induced reactions of halogenated molecules adsorbed on ice surfaces: Implications for atmospheric ozone depletion and global climate change Important paper by Qing-Bin Lu on the impact of cosmic rays and stratospheric chlorine: ongoing cooling predicted (also here): "...the data strongly indicate that global temperature has been dominantly controlled by the level of CFC's, modulated by the CR-driven ozone depletion over the last century. " Is CO2 not the villain anymore? BTW, there will still be glaciers in the Himalayas in 2035 How the IPCC 4AR goofed spectacularly on Himalayan glacier melt. Read also this paper from ETHZ: Swiss glaciers melt faster during the colder 1940s than today! Glitter-sized solar photovoltaics A new development by a Sandia National Laboratories team of micro-solar cells, consuming 100 times less silicon and pointing to a potential revolution in photovoltaics. Copenhagen Climate Concerns A large set of small videos on many points of the climate debate. The Smoking Gun at Darwin Zero Excellent detective work of Antony Watts showing that the "adjustments" to the raw data transform a cooling trend to one of warming. The IPCC data of Australia are more the result of fabrication than measurements! Windige Geschaefte mit heisser Luft Excellent article by A. Baur (Die Weltwoche) on CO2 certificates and the working of the Swiss NGO "myclimate". In German. (hat tip: R. Turpel). See also here. Open letter to the President of the Maledives Are the Maledives drowning? No says Prof. Nils-Axel Moerner. Is Earth's Capacity to Absorb CO2 Much Greater Than Expected? Another bombshell in IPCC's garden: Airborne fraction of anthropogenic emitted CO2 constant since 1850. (from ScienceDaily). See also here and here. Himalayen Glaciers New inconvenient research report from India: GW is not the cause of melting Himalayan glaciers! Read also here. New peer reviewed paper by F. Massen and E-G. Beck presented at the online Klima2009 conference. First in the top 10 of 103 published papers! Economic Impacts from the Promotion of Renewable Energies: The German Experience A very clear report from RWI (Rheinisch-Westfälisches Institut für Wirtschafts-forschunng): "CO2 abatement costs from PV (photo-voltaics) are estimated to be as high as 1035 US$ per tonne." Climate Modelling Nonsense Outstanding article by Dr. John Reid: "..climate prediction, as it is carried out by those organisations which come under the aegis of the IPCC, is not science. It is a superstition..."
Global Warming and Sea-Level Rise A short but interesting paper by M. Khandekar. Best gues for 2100 is 23 +/- 5 cm ! On the determination of climate feedbacks from ERBE data Very important paper by Lindzen & Choi which shows that climate feedbacks are negative, opposite to the findings of 11 GCM's, and that climate sensitivity is low..
Read a very extensive comment by Roy Spencer here and another by Lubos Motl here. 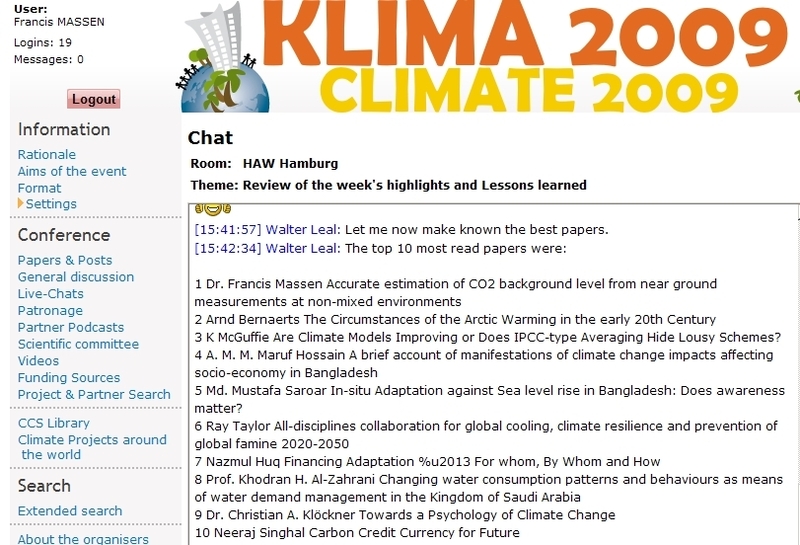 A debate in 2 parts on AGW by Dr. William Gray and Dr.Kevin Trenberth. I find Dr. Gray's arguments much more convincing! Stabilizing World CO2 Emissions: A bridge too far? 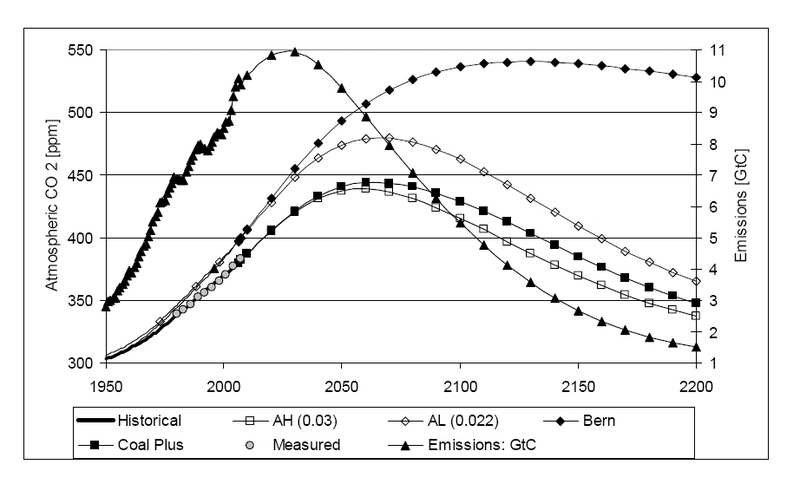 Paper of the A. Moran institute: "..estimates that deferring cuts until later would for the same quantity of emission reductions reduce costs to ~10% of those entailed by an early start". EU R&D hostage of eco-religious fundamentalism? The Malaria Myths of Climate Change By Prof. Paul Reiter from the Pasteur Institute. White roofs and pavements Several reports on the effect of enhancing albedo by painting roofs and pavements white: LBNL short comment, Akbari's presentation and paper. Geo-engineering, giving us time to act? A report of the UK Institution of Mechanical Engineers proposing artificial trees as the preferred solution to remove CO2 from ambient air. Global warming is global energy storage Very interesting paper by Nordell & Gervet:: could the major part of the last 120 years global warming be explained by heat emissions (and not greenhouse gases)? Freeman Dyson on climate change A new interview with Freeman Dyson in environment360 (Yale University). BP statistical review of world energy: ppt, full report here! Climate change: science manipulated. By Prof. S. Akasofu. Limitations on Anthropogenic Global Warming. Excellent paper by Leonard Weinstein, from Nasa. What if global-warming fears are overblown? Excellent interview of Dr. John Christy in CNNmoney.com. 2009 International Conference on Climate Change List of presentations and talks given at the 2009 International Conference on Climate Change. No we don't need 5 planets by B. Lomborg (17Apr09). The Civil Heretic Read this 8 pages article in the New York Times on Princeton professor Freeman Dyson, a global warming skeptic by excellence. Sulfur Dioxide Initiates Global Climate Change in Four Ways Could SO2 explain last centuries warming and cooling periods? Read abstract of paper by Dr. P. Ward. We can't solve global warming A discussion of East Anglia University professor Mike Hulme's statements, by Mike Swain, Science and Environment Editor for the Daily Mirror: "We shouldn't be framing climate change as the problem that we have to solve above all others." Has the climate recently shifted? Paper by Swanson et al. : "...a break in the global mean temperature trend from the consistent warming over the 1976/77–2001/02 period may have occurred." Statement on climate change by Princeton University physics professor W. Happer. Validity of Climate Change forecasting for Public Decision Making by Green/Armstrong/Soon: "The (no-change) benchmark forecast is that the global mean temperature for each year for the rest of this century will be within 0.5°C of the 2008 figure." Testimony of Dr. P. Michaels for the US Committee on Energy and Environment. Climate future Essay from K. Beckman: “Climate change has grown into a large bureaucratic, industrial and political machine, on which the livelihood of many thousands of people depends." Also R. Pielke Jr.'s very intelligent comment on "The Collapse of Climate Policy". Climate alarm: What We Are Up Against, and What to Do Presentation by R. Lindzen at the ICCC: "..nature is, as any reasonable person might suppose, dominated by stabilizing negative feedbacks rather than destabilizing positive feedbacks"
Fire or Ice? The role of peak fossil fuels in climate change scenarios. Excellent article in the OIL DRUM by Ugo Bardi. Peak of fossil fuels limits CO2 levels to about 450-550 max. Read also here, here and here. See graph here (Nel paper). Antartctica is cooling If Steig had done it correctly, it would have shown up. Paper by Ken Gregory. "I believe that the increase of CO2 is not a cause for alarm." TESTIMONY of Patrick J. MICHAELS to the Subcommitte on Energy and Environment of the Committe on Energy and Commerce, U.S. House of Representatives. "..all we know is this: calculations of the costs of inaction, based upon models that are clearly overestimating warming to the point that they can no longer be relied upon, are likely to be similarly overestimated". Very clear demonstration that the IPCC ensemble of 21 climate models does not agree with observed temperature trends. All other testimonies and video here (I recommend the video if you have a couple of hours to spend). Climate Future Essay in the European Energy Review by K. Beckman: “Climate change has grown into a large bureaucratic, industrial and political machine, on which the livelihood of many thousands of people depends." Also R. Pielke Jr.'s very intelligent comment on "The Collapse of Climate Policy". CO2 reconstruction from stomatal frequency in fossil needles. Phd thesis (2004) by L. Kouwenberg, University of Utrecht. Look for graph here! Are ice core CO2 data really ok? 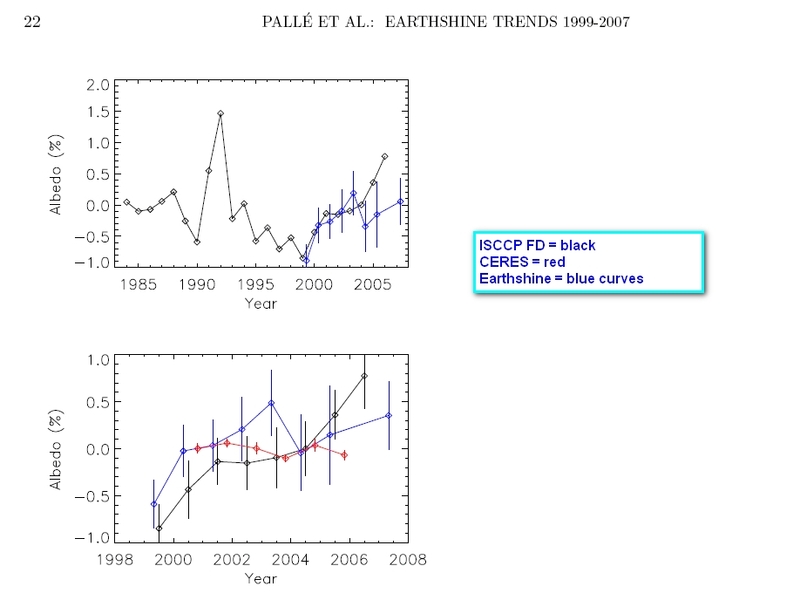 Interannual variations in Earth's reflectance 1999–2007 New important GRL paper by Pallé et al on albedo variations; read abstract and comments here: "...we have demonstrated that the trend toward an increasing terrestrial albedo seen in the earthshine is due to evolving cloud properties"
Look here for 19984 to 2007 and here for recent global albedo data. Contribution of Fish to the Marine Inorganic Carbon Cycle R.W.Wilson an al. show that fish poop is an important source of carbonate, helping keep down ocean acidification (fish poops may contribute up to 15% of the carbonate production). With possible rising fish populations, this would be a negative feedback (abhorred by the IPCC!) to the consequences of AGW. Advocacy Threatens Scientific Integrity Comment by R.E. Levine in the Jan09 edition of the American Physical Society (APS) newsletter. The APS Council should reassert the primacy of the openness principles, which were abandoned in its "climate change" position.